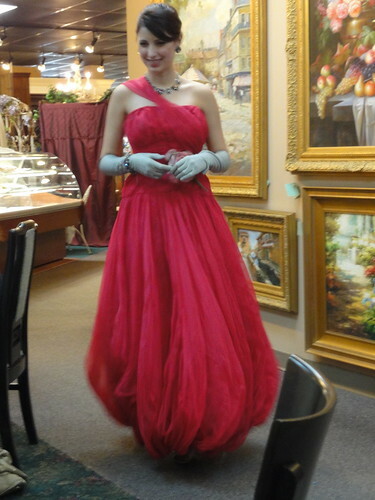 Yesterday, I got together with two of my costuming friends and we went to a "Fabulous 50's" fashion show at a local antique mall/tea room. 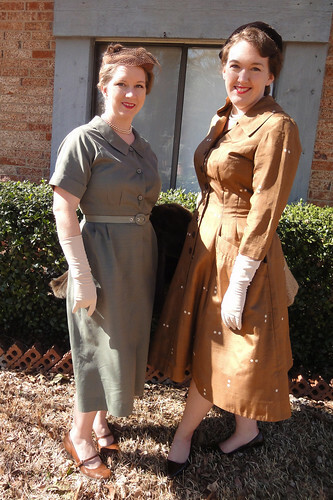 It was even better because Christy and I used it as an excuse to dress up in our new vintage 50's outfits. 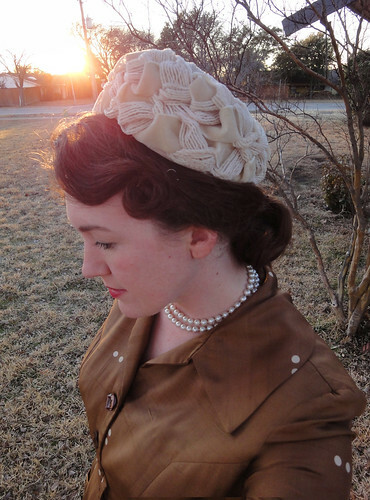 Girly outings are always more fun when you are wearing gloves, pearls, and fur! I tried to pincurl my hair, but the back refused to cooperate, so into a chignon it went. *bah* I also didn't have a hat that I really liked for this outfit, but that problem was solved beautifully when I picked up this little $7 beauty at the antique mall after the fashion show. The fashion show itself was fun too, but I was surprised by how "normal" a lot of the dresses looked without 50's hair, makeup, and undergarments. It's amazing how much those finishing touches matter when capturing the look of a period. My favorite part of the fashion show was the evening wear. Most of the gowns were so timeless that they looked more like something from this year's Academy Awards red carpet vs. something your grandma once wore! I got pictures of nearly every gown in the show, and you can see them all in my Flickr album. 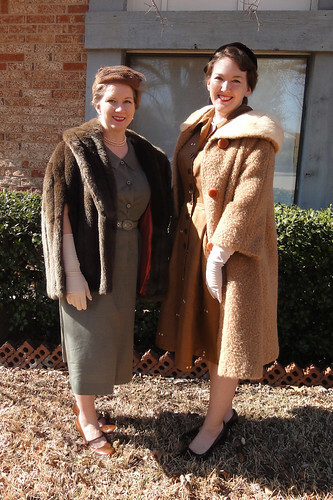 There will also be a repeat of this show, plus even more 50's fashions, at the Antique Elegance Show next Saturday at 9:00. So even though I've been pretty quiet this winter, I have been staying busy behind the scenes - so busy that I haven't had much time for blogging. But we have another snow day today, so it seemed like a good time to play catch-up and give you a little "state of the union... er... of jen" address! 1. I've been working on getting all the DFWCG event graphics made and posted to our website. We have some really cool things planned for this year, and if you are in the area, I hope you'll join us for some costumed shenanigans in 2011! 2. 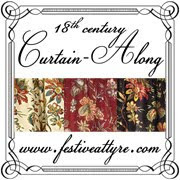 I added some more vintage patterns to my flickr archive. 3. My 16-year old cheap-o beginner sewing machine finally bit the dust, so I bought a shiny new Janome Magnolia this week! I am totally in love with this thing! 4. I am working on two new costume projects right now that my son and I will wear in the Chestnut Square fashion show next month. My dress is inspired by this 1918 dress from the New Idea Quarterly magazine that was given to me by my grandmother, and it is being cobbled together using a variety of patterns from my own collection and from CoPA. 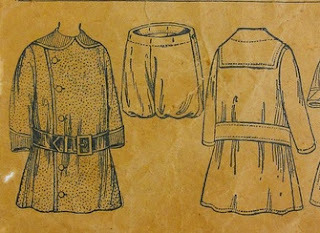 My son is getting a suit made with one of my new old patterns from 1919. I'm really excited about both of these, and I'll definitely be posting more about them soon! It seems like it has been forever since my last blog post... although you really haven't been missing much. Mostly I'e been working on 2011 planning with the DFW Costumers' Guild, and taking a much-needed break from tight-deadline, stress-inducing costume projects. The one thing that I did mean to write about back in December was the Victorian Christmas ball that I went to with my husband. I've always dreamed of attendig a real live ball (*squee! *), but we ended up not knowing anybody there, and I'm afraid that we were quite the timid wallflowers. But it was still fun to get all dressed up and go somewhere, and I was pretty happy with the way the dress turned out. I had just enough scraps remaining to make a new bodice to go with my 1868 silk daydress. I had to piece the bejeezus out of it to make it work, but it was fun to give this older dress a new life. For the pattern, I used the 1870-71 ballgown bodice from Patterns of Fashion. It went together well, but I wish I could have done some more tweaking on the bertha before I wore it. As usual though, I was sewing up until it was time to get in the car and go to the event, so I was pretty happy to just have it wearable. I also re-boned my elliptical hoop skirt that I made with the Laughing Moon pattern. The first time I just used wire rope (bought from Home Depot), which wasn't strong enough to hold out the bottom hoops in back under the weight of a heavy skirt. But I went back and reinforced it with piano wire (from a Hobby shop), which did the trick nicely. I love the shape of this hoop - it is small, but gives the skirt such a pretty flare. Unfortunately, I didn't get many pictures that night, and the ones that I did get were dark and blurry, but maybe this is better than nothing. You can see more on my website.